Roofing In Central Florida For Almost 30 Years! Don Schmidt Contracting and Roofing, Inc. is a local and family owned business that has been serving Central Florida since 1988 and Osceola County residents since 1959. Don Schmidt, learning construction from his father, obtained his contractors license in 1972 in both building and remodeling residential homes. In the 1980’s he received his Florida State Certified Roofing license and formed Don Schmidt Contracting and Roofing, Inc.. He is joined by his oldest son Jared, who is following in Don's footsteps by learning every aspect of the roofing and contracting business. When you call for a free, no obligation roof estimate, Jared is more than happy to give you a professional, courteous and reliable roofing quote. The Don Schmidt roofing family also includes Jeff Rowe in the office, who is a lifetime Osceola County resident and member of our professional roofing staff. Jeff ensures that every customer receives the finest customer service available and that customer expectations are not only met, but exceeded. Our contracting and roofing business, located at 101 East 13th Street in St. Cloud, is licensed, bonded and insured through both state and local agencies. We are members in good standing with the St. Cloud Chamber of Commerce, Florida Roofing and Sheet Metal Association (FRSA), Central Florida Roofing and Sheet Metal Association (CFRSA) and are a Preferred Owens Corning Contractor, a Gaf Authorized contractor, Johns Manville and OSHA certified. Don is very active in the roofing industry, participating on a number of boards and committees such as the Florida Emergency Disaster Relief program and an officer of the CFRSA. 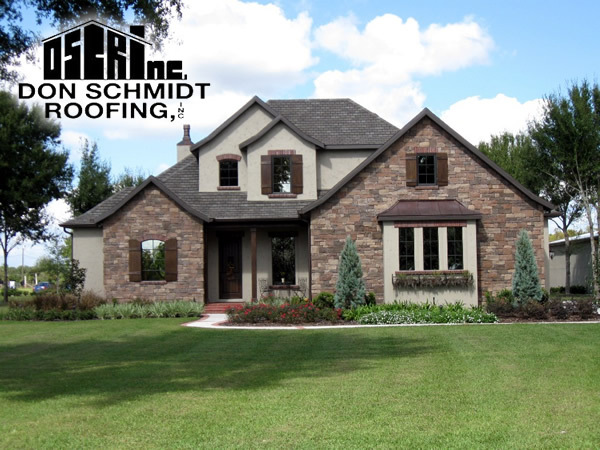 At Don Schmidt Roofing and Contracting we believe in quality customer service and would like to earn your business! Still have questions about roofing or about how to decide on the direction of your new roof or roof repair just ask. We have the answers! Don Schmidt Contracting and Roofing, Inc. is a local and family owned business that has been serving Central Florida since 1988 and Osceola County residents since 1959. Don Schmidt, learning construction from his father, obtained his Contractors license in 1972 in both building and remodeling residential homes. In the 1980’s he received his State Certified Roofing license and formed Don Schmidt Contracting and Roofing, Inc. .